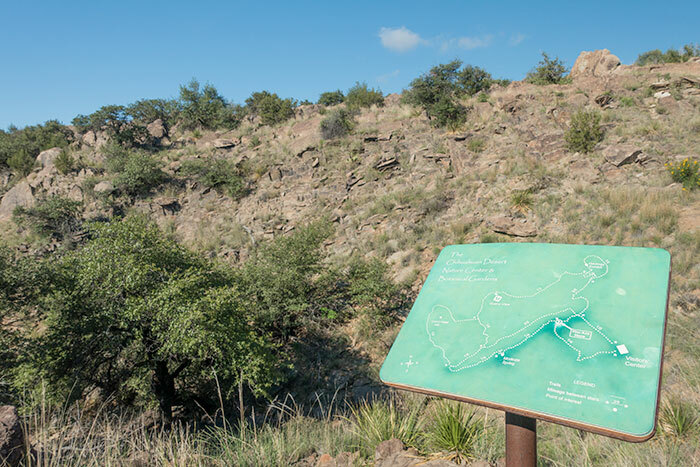 Modesta Canyon Trail is a 1.8 mile loop starting at the Powell Visitor Center at the Chihuahuan Desert Nature Center in Fort Davis, Texas. 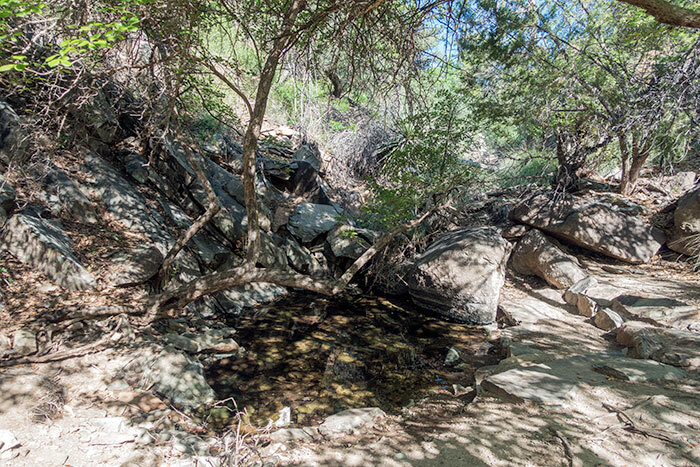 This trail will take you down into a rocky canyon to a year-round spring that feeds a couple of small pools. The Nature Center website states that these pools support a fragile ecosystem of tree frogs, salamanders and crayfish. We did see one frog hop into the water when we got down here, but due to a few mosquitoes at the time we were there, we decided to move on after a short pause to explore. 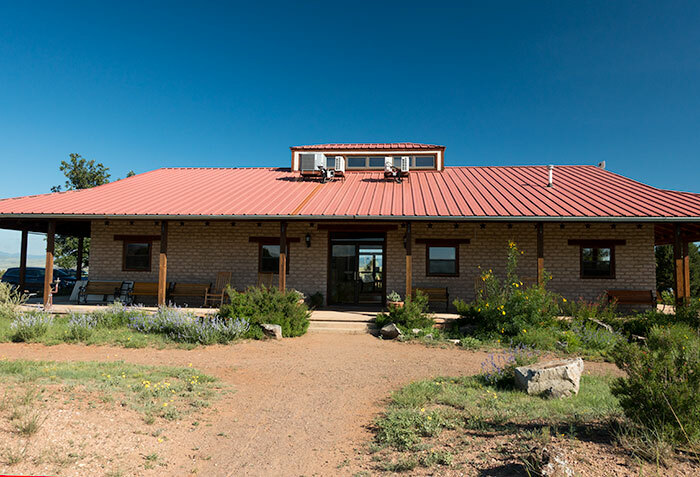 Beyond the spring, you make your way around a small hill back to the rim of the canyon, and eventually back at the visitor’s center where you started. 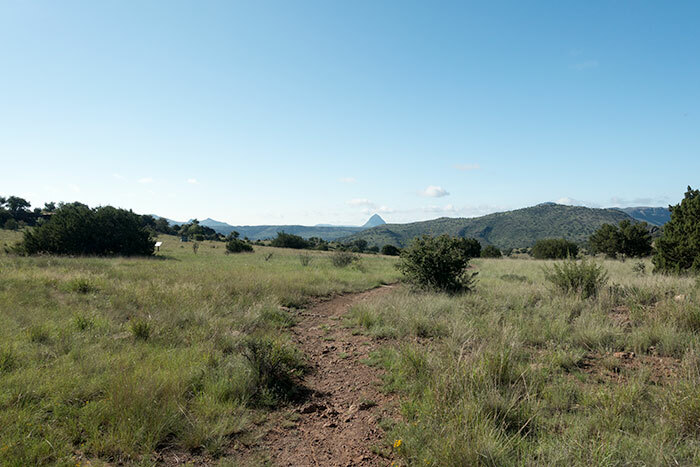 You’ll want to be certain that you have sturdy boots for this trail since it can get rocky and the footing can be difficult at times. You can start this trail at two separate trail signs that you’ll find in the rear of the visitor’s center. For this hike, we chose the beginning point at the sign directly out the back door of the building. This route made the steepest portion of the trail a downhill hike, as opposed to uphill at the end of the hike. Either way works just fine. From the trail sign, you’ll start making your way across a grassy area, toward Modesta Canyon (sloping to the right in the picture below). 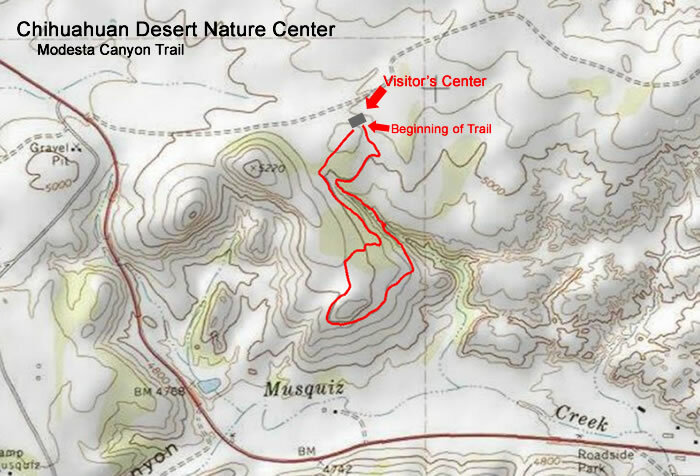 It only takes about a quarter of a mile to descend from the highest point on the trail (the visitor’s center), down about 200 foot, to the lowest point on the trail (at the bottom of the canyon). As you’re making your way toward the canyon, keep an eye out for the green map-signs indicating which direction you need to go. The trail system here is interconnected and it isn’t hard to head the wrong direction if you aren’t paying attention. It’s helpful to keep a copy of the map given to you at the visitor’s center since each trail is highlighted in different colors (in this case, green for Modesta Canyon Trail). 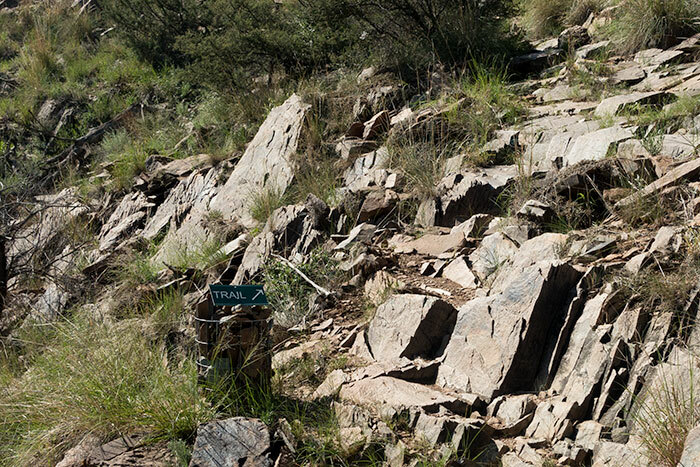 Shortly after you pass the first map sign (photo above) you’ll starting making your way down into the canyon. Be very careful of your footing through here as the rocks can be jagged and loose. It would be easy to slip and fall or to tweak an ankle. 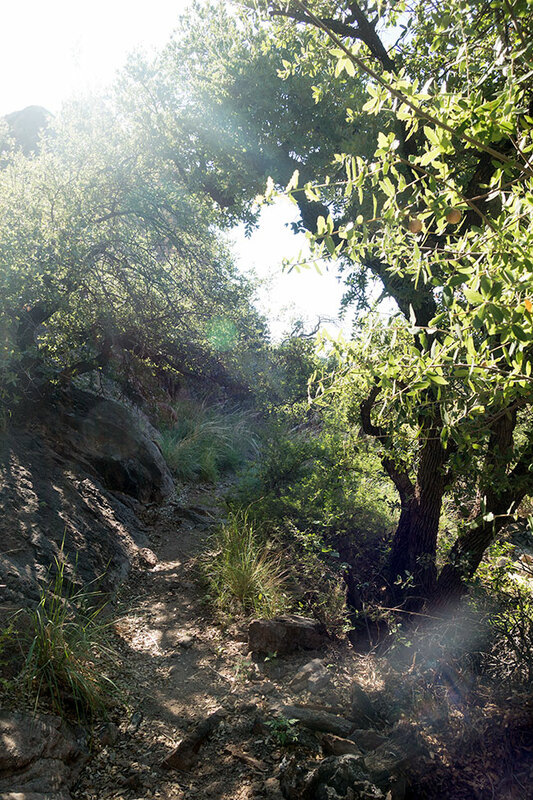 A little way down the canyon, you’ll find a year-round spring. As you start the climb out of the creek, take your time, the rocks underfoot get both sharp and loose. 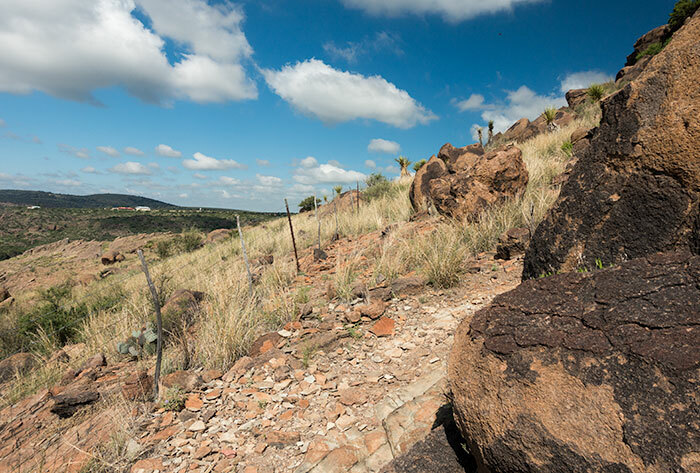 You’ll also want to keep a close lookout for the signs indicating where the trail goes. It can get hard to see at times. Once you’ve gotten out of the canyon and have worked your way to the hilltop, you’ll start seeing the valley that Highway 118 and Musquiz Creek run through in the distance (due South). 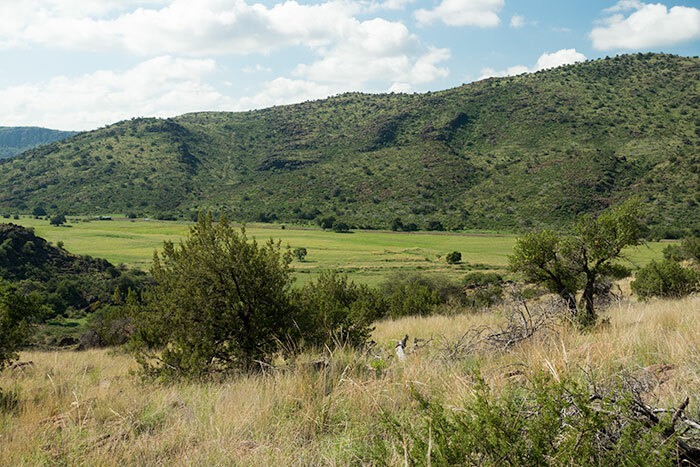 From here, you’ll start winding your way around Lion’s Head Hill to a fence line that separates the Chihuahuan Desert Nature Center from private property. From this point, you’ll be working your way back toward the rim of Modesta Canyon, then eventually to the visitor’s center. 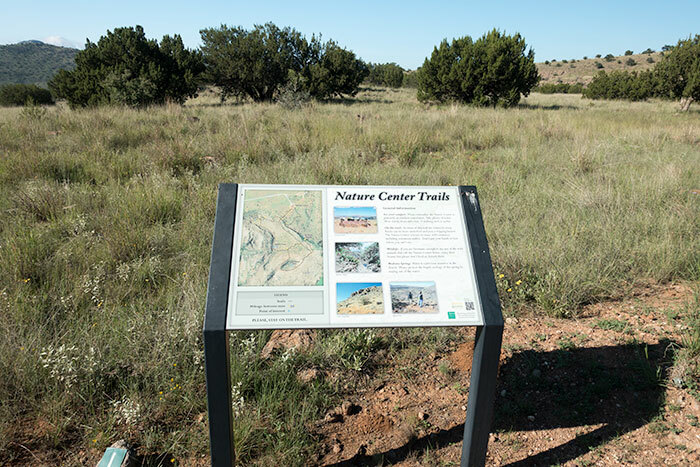 Just keep an eye out for the trail signs along the way back so that you don’t take a wrong turn.